We are truly delighted to inform you that our brand new show home for our highly anticipated The View development within Colwyn Bay is finally here. Indicative of these new build houses in North Wales, This wonderful building is known affectionately as “The Harlech” and offers a taste of your new lifestyle within what we feel is the most enviable location within North Wales. A very special private and gated development, The View by Blue Bay will afford you all the privacy you need, and a lifestyle to match. Imagine pulling up to your very own attractive block-paved and very spacious driveway, popping the car safe and sound within its very own spacious garage and then entering the home of your dreams. Your brand new home oozes quality in absolutely every aspect – even the doors with use of attractive oak veneered doors, with stainless steel handles to each and every room. As you enter you can shake off all the chills of the season thanks to your brand new homes condensing combi boiler. As soon as you enter your new home you’ll feel the benefit of the gas fired central heating, which is designed with comfort and economy in mind. As you enter the light, breezy and airy kitchen, you’ll be delighted by the wonderfully contemporary styling as well as the quality of the appliances which are included within each and every one of these properties. Imagine a brand new stainless steel oven and hob, with a stainless steel and glass canopy hood which is supplied in your brand new home! We think there’s nothing worse than having to take measurements to make sure you can fit your appliances into a new home, and as such – appliances are included within our kitchens. There’s no stress and no strain when it comes to moving into our very special homes – we’ve taken care of all for you. Furthermore, you’ll be similarly delighted to find that our design includes a series of space-saving features such as an integrated fridge freezer, and cabinets which will make your kitchen a dream to cook in, with no stress whatsoever – moving in or getting on with cooking! Additionally, you can make your kitchen your very own with a variety of tiling and cabinet options to put your very own distinct stamp upon your brand new home – in order to make it well and truly yours. With a sweeping sea view, dining is a very special experience at The View. Also the feature of your living room, there’s nothing quite like the sea – for eras it has been the source of countless homage in many forms be it songs, poems, or otherwise. It’s safe to say that the sea has captured the hearts of men and women the world over, and this highly enviable view of the stunning North Wales coastline may very well provide you with inspiration, and peace as you gaze out into its vast blue. 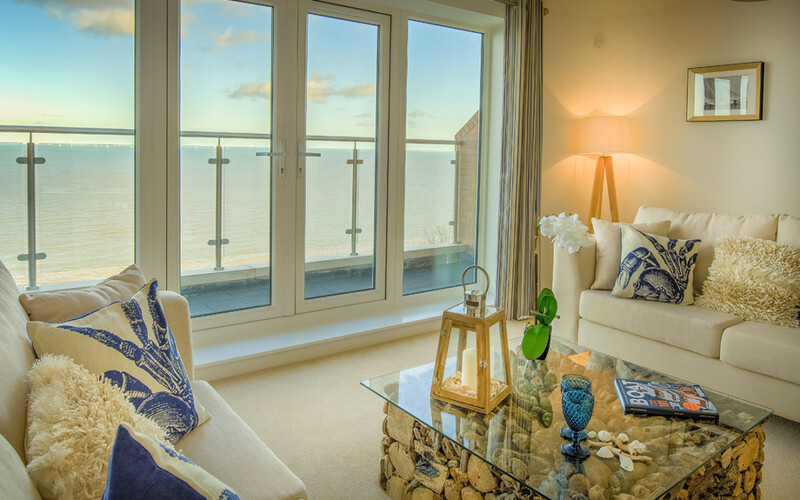 Blue Bay Homes have endeavoured to provide luxury living with our homes – to provide you with a home as equally special on the inside as your view is on the outside. Should you wish to visit The Harlech, you’re more than welcome to contact us or visit our sales office at The View, Abergele Road, Old Colwyn, Conwy LL29 9LD.